Jean Moon, PharmD, joined the University of Minnesota North Memorial Family Medicine Residency faculty in 2005. She practices comprehensive medication management and precepts residents and students. 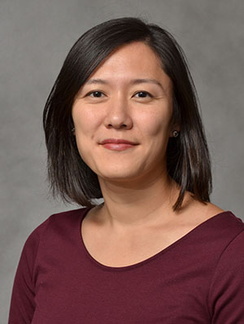 Along with her faculty responsibilities teaching pulmonary and women's health, she also serves as the residency program director for the PGY-1 pharmacy residency program comprising 25 residents across the state of Minnesota. Frail CK, Chapman SA, Jolowsky C, Moon JY, Philbrick, AM. Supporting quality in experiential education through enhanced faculty engagement. Currents in Pharmacy Teaching and Learning. 2017, 9(6):962-965. https://doi.org/10.1016/j.cptl.2017.07.003. Moon JY, Lounsbery JL, Hall A, Ballard SL, Owens N, Slattengren A. Clinical pharmacist faculty contribution to evidence-based medicine and milestones. PRiMER. 2017,1:9. doi: 10.22454/PRiMER.2017.393370. Pittenger AL, Chapman S, Frail CK, Moon JY, Undeberg M, Orzoff J. Entrustable professional activities for pharmacy practice. American Journal of Pharmaceutical Education. 2016, 80(10) 2016: Article 178. Lounsbery JL, Pereira CR, Harris IM, Moon JY, Westberg SM, Kolar C. Tracking patient encounters and clinical skills performed to determine competency in ambulatory care advanced pharmacy practice experiences. American Journal of Pharmaceutical Education. 2016; 80(1): Article14. Moon JY, Kolar C, Brummel A, Ekstrand M, Holtan H, Rehrauer D. Development and validation of a patient satisfaction survey for comprehensive medication management. Journal of Managed Care and Specialty Pharmacy. 2016 Jan; 22(1):81-86. Moon J. Recently approved by the FDA: a look at new medications for common ailments. Minnesota Physician. XXVII(12):30-32. Lounsbery JL, Moon J, Humphrey A, Prasad S. Optimizing resident physician use of clinical pharmacy services. Family Medicine. 2013;45(1):33-6. Jean Moon's clinical areas of interest include pulmonary medicine, women's health, motivational interviewing, and interprofessional practice. PHARMACY ROLE: Dr. Moon established clinical pharmacy services at Broadway Family Medicine in 2004. These services work to improve the care of chronic disease in an underserved patient population by offering in-clinic comprehensive medication management service to patients, training students and resident providers to promote the safe and effective use of medications, and help patients achieve their medication therapy goals through interprofessional team care.